My Mount Kinabalu Tale (Part 1) | Teefa Says..
Agak lama i menyepi. Bukan sahaja busy, malah takda mood untuk membelog. Ni dah ada ilham, baik haku curahkan sebelum writer's block menyerang kembali. Writer kah?? My Kinabalu trip post ni terbahagi kepada dua lah ye. Dah try to sumbat in one post, tapi panjang sangat bebelannya. Anyway, as you probably have read here, i have climbed Mount Kinabalu when i was 21, while studying at Universiti Malaysia Sabah. Over la kan kalo ko study kat Sabah tapi tak panjat gunung itu. Back then i wasn't prepared. Didn't have proper attire and tools, i jogged and played futsal twice as my so-called training. As a result, i was freezing up there and while descending the mountain, my toenail was severely damaged that it had to be removed. And i vowed never to go EVER AGAIN! Apparently i've forgotten my vow.. i went again for the second time, last month. A wise person will learn from her mistake. Being a 'wise' girl myself, i've learnt my lesson this time. i went to the gym more frequently 2 months prior to the climb, did intense training for the last 1 month (my definition of intense training is going to the gym for 4 days a week. Intense for me, baby training for some people -_-), and played a bit of futsal. i focused more on strengthening my legs by using the steps machine and went for RPM (spinning classes) twice a week to build stamina. Aside from gymming, i joined the SOC Club hiking up Gunung Kutu and Bukit Tabur on weekends. Diorang ajak gi panjat tangga Batu Caves on Saturday mornings but i love my bed more than i love those stairs so i didn't join. On the way to Bukit Kutu. The peak is on a huge rock. Kalo ko naik atas batu tu, kemungkinan untuk jatuh dan mati adalah tinggi. Maka saya hanya berdiri di bawah batu itu. Gayatttt! My brother, Redha and i. And the chimney near Bukit Kutu peak, hasil tinggalan tentera British dulu. Bukit Kutu ni dulu adalah kubu untuk mempertahankan Fraser Hill dari serangan musuh. Chimney and tempat kitorang melepet kepenatan. Berjaya naik puncak pertama Bukit Tabur. Perjalanan tak diteruskan sebab safety reason. View from Bukit Tabur. Area Taman Melawati and KL. Untuk tidak mengulangi kesilapan lepas, aku bawak banyak sikit barang lah to Kinabalu ni., just to be more prepared. Kalo korang (especially ladies) yang fit-tak-berapa-nak-fit macam aku ni nak naik gunung, boleh la ikot this list as your guidline. -i brought 2 t-shirts, 1 thermal t-shirt, 1 sweater, 1 windbreaker, 1 tracksuit, and 1 pair of khakis. -Waterproof gloves, non-waterproof gloves (spare), 3 pair of socks, arm socks, and snowcap. Yes, these are a lot to bring. Dah la nak mengangkut benda-benda ni, nak mendaki lagi. For that reason, our team leader had hired a few porters to carry some of our stuff to Laban Rata. Barang-barang macam gloves, thermal shirt, and water bottles (meaning benda alah yang ko nak pakai from Laban Rata to Low's Peak and perjalanan turun), ko bagi lah siap-siap kat porter tu. Kalau nak bawak sendiri pon boleh je. Tapi patah pinggang tak jamin yeeee! February 12 finally came. We flew off to KK that Friday morning. As we landed in KK, i felt strangely happy. It's like coming home. Rindu gila KK okeh. Berair sebak jugak la mata ni.. Sampai airport we went straight to Kinabalu Park sebab esoknya nak terus mendaki. Just reached the Kota Kinabalu International Airport. 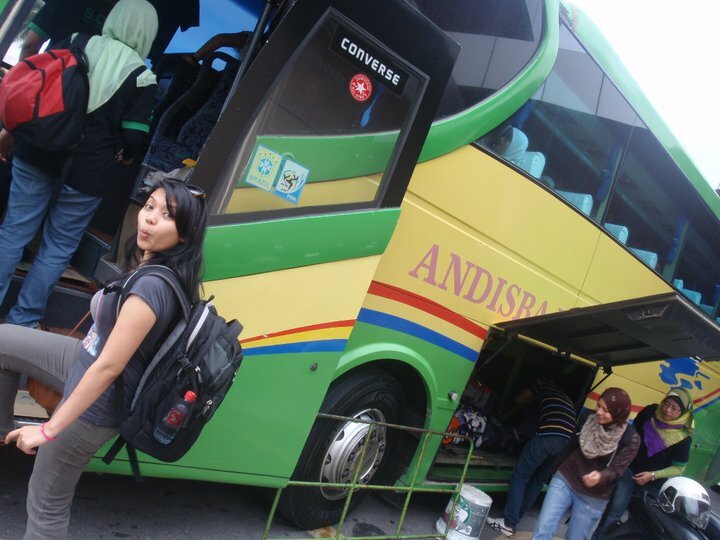 These are the girls that made my Kinabalu trip bearable. From left Mariah, yours truly, Chuna, Mas, Azna and Noni. Shim and Lela are not in the photo. We reached the Kinabalu park around 5pm. It was raining super heavily, we were worried that it'd rain like that tomorrow during our climb. Penat gler time tu, all i wanted was to get in our hostel room, mandi, eat dinner and sleep. Hehe. I thought our hostel will be like those cheap-backpackers kinda hostel but i was wrong. The accommodation was managed by Sutera Sanctuary Lodges so they are nicely kept. A room for four with two double decker beds. There are a few types of accommodation to choose from; depending on your budget. We were served with buffet dinner that night. Though there were not much choice, they cater Western and Eastern food. The grilled stuff were yummy! 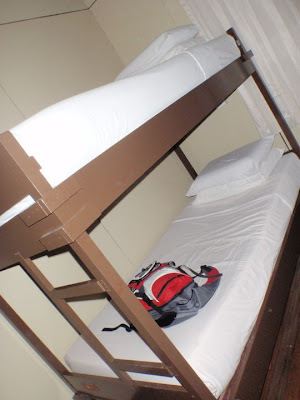 One of the two double decker beds at The Rock Hostel, Sutera Sanctuary Lodges, Kinabalu Park. The toiletries provided. You don't have to bring any, these are enough. Okay. i'll continue later with The Climb. 1 comment on "My Mount Kinabalu Tale (Part 1)"